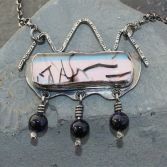 The Contemporary Dichroic Glass Necklace has been handcrafted by me. The Dichroic Glass cabochon has been made using 3 layers of glass that have been fused together in my kiln, the bottom sheet is a Dichroic glass which gives it multi tonal shimmers that change colour. 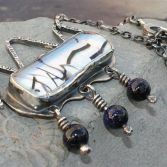 I have then set the cabochon into a sterling silver setting which i made to fit the glass. 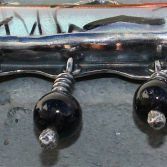 The Necklace measures 4.2cm at across and is 4.5cm long including the centre Blue Goldstone beads. 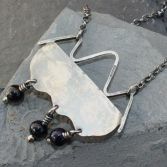 The chain length is 18inches but can be worn at 16.5inches also, it has a strong sterling silver clasp and all the links have been soldered together at connection points. 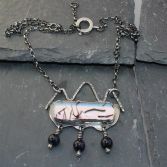 The necklace has been highly polished and then given a oxidised blue black finish. You will receive the necklace shown. 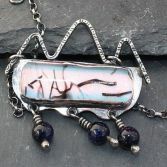 The Contemporary Dichroic Glass Necklace has full UK Hallmarks stamped at an official Assay Office. 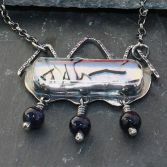 I have only made one of these necklaces and it can not be easily copied so you are buying a one of a kind piece of jewellery. 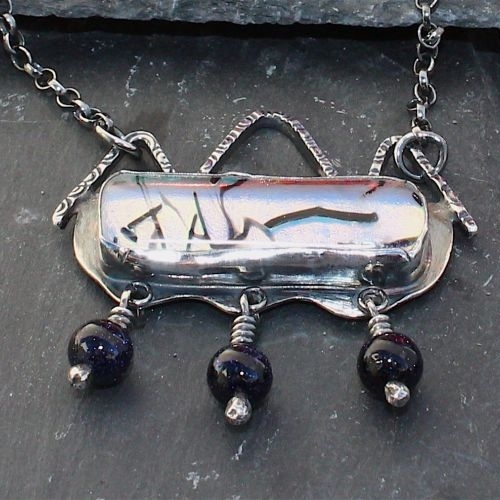 Your necklace will be packed in a gift boxes and placed in a padded envelope and posted via Royal Mail 1st Class recorded delivery (signed for) to any address in the UK free of charge.